The Needles old battery and lighthouse as seen from the new battery. The Needles were a site of a long-standing artillery battery, from the 1860s to 1954. It was employed in the testing of rockets for the British ICBM programme and was used for Black Knight and Black Arrow rocket engine tests from 1956–71. These rockets were later used to launch the Prospero X-3 satellite. 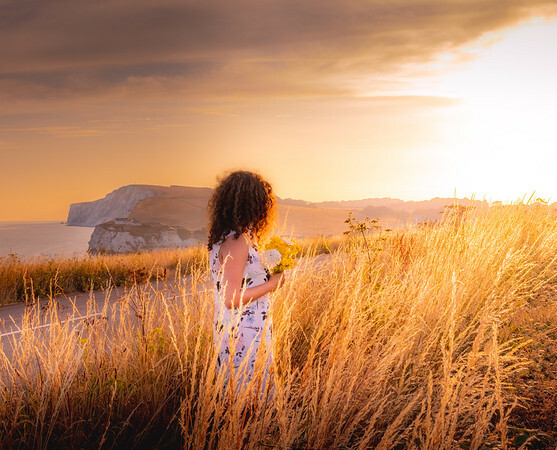 @eyeseesurs posing with some freshly picked wild flowers on an unknown road on the Isle of Wight. 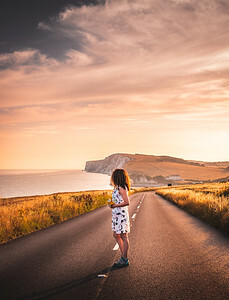 We were driving on this empty road on our way to the Needles when the sun began to set and we decided to shoot some backlit landscapy portrait shots. The tall reeds provided a perfect setting by catching the warm light from the setting sun and giving the whole scene a golden glow. We were here early in the evening scouting for some milky way photography that night when I noticed the sun was aligning perfectly with the top of the tower and the shadow was creating great leading lines. 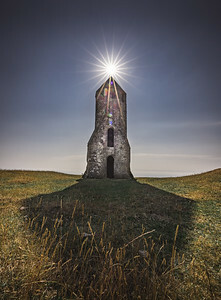 St. Catherine's Oratory is a medieval lighthouse on the southern coast of the Isle of Wight. 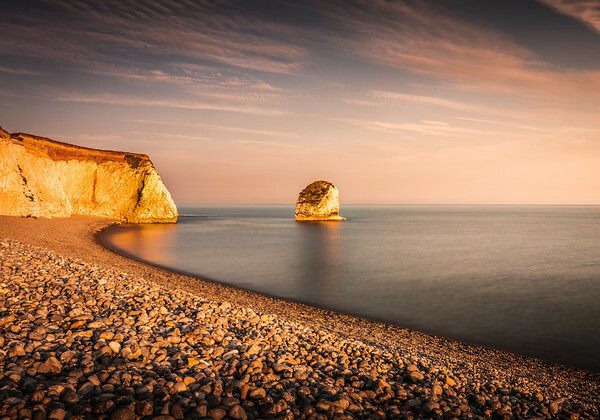 It was built by Lord Walter de Godeton as an act of penance for plundering wine from the wreck of a ship called St. Marie of Bayonne in Chale Bay in April 1313. He was tried by the Church courts, since the wine was meant for the monastery of Livers in Picardy. The Church threatened to excommunicate him unless he built a lighthouse near Chale Bay. It is Britain's only surviving medieval lighthouse. We decided to climb up Headon Warren located in the Totland Bay, the hill opposite the Needles. 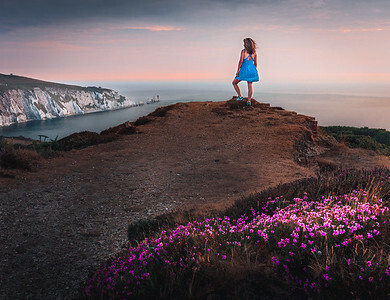 As soon as we reached the top @eyeseesurs spotted this mound a little off the trail which offered a spectacular view of the Needles and Alum Bay and was a perfect spot to pose for this shot. I decided to use the last of the spring wild flowers as foreground to bring this image together. 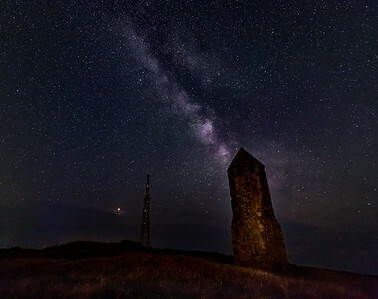 St. Catherine's Oratory on the Isle of Wight is a perfect place for some star gazing and astro-photography. 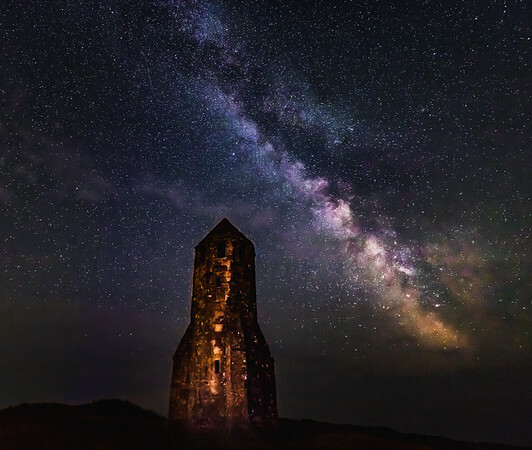 It offers astounding views of the night sky with very less light pollution because of the fact that it is surrounded by ocean on one side and vast farm lands on the other while being a relatively short and easy hike from the car park. 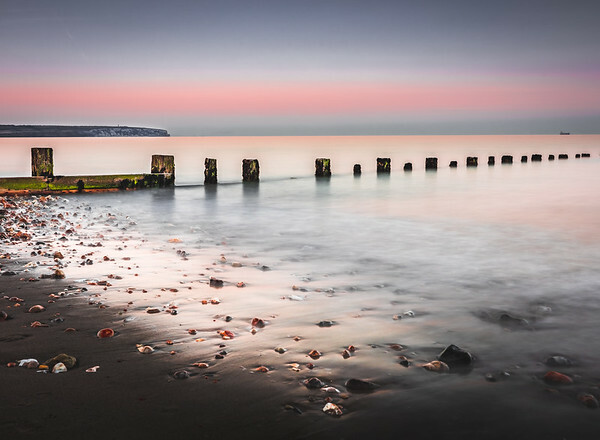 A post sunset long exposure at Totland Bay Pier. 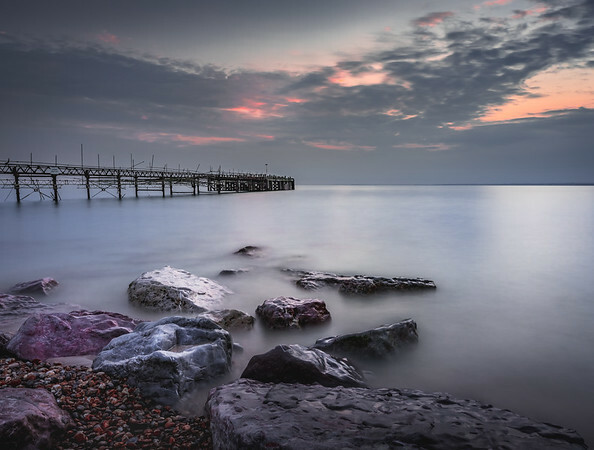 The Totland Bay Pier was opened in 1880. It was popular with pleasure steamers until World War I. During World War II, a deliberate gap was made in the pier so that it would be unusable in the event of an attempted invasion. It was reopened in 1951 and was used until 1993. We were on our way to the Needles for some sunset shots and were driving on this sparringly used country road. We took a quick photo stop to get some pictures of the empty road when we noticed this field of reeds was shining so bright and golden in the setting sun that we just couldn't pass up on this shot. @eyeseesurs posing with some freshly picked wild flowers. We were on our way to the Needles and our route took us through the village of Freshwater. The bay looked spectacular in the golden light from the setting sun and we decided on a quick stopover. Freshwater Bay is a small cove on the south coast of Isle of Wight. 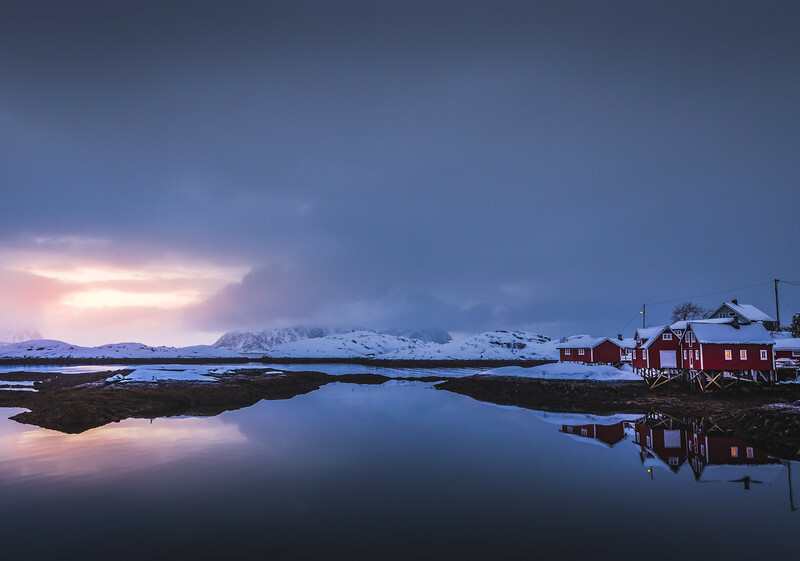 Freshwater is famous for its geology and coastal rock formations created by coastal erosion. The "Arch Rock" was a well-known landmark but collapsed on 25 October 1992. The formation seen here is called the "Stag Rock" because supposedly a stag leaped to the rock from the cliff to escape during a hunt. Shanklin is a small seaside town on the Isle of Wight. This sandy beach was just a 5 minutes walk from our hotel so a perfect shot to shoot sunset on the day we arrived. Although not a lot going on in the sky, the beach and offered some interesting foreground to complement the pastel shades of twilight. 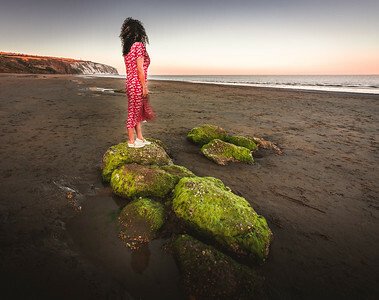 On our last evening on the Isle of Wight, we visited the Sandown Beach for sunset. It was a cloudless evening so not much going on in the sky in terms of sunset colours but the low tide had created these beautiful little tidal pools of still water which were creating great reflections. So, I decided to keep minimal sky in the frame and use the reflection and the patterns created by water in the sand as the foreground. The cliff in the background is Cluver Down with the Yarborough Monument standing tall on the top. 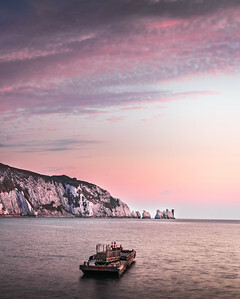 The Needles at dusk. We had an amazing sky on the day - brilliant clouds and beautiful pastel shades of pink and blue. 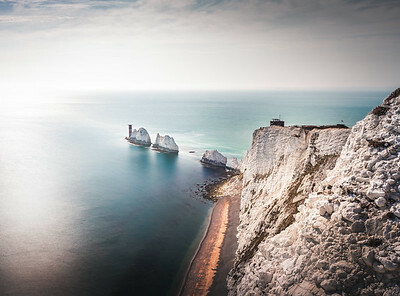 The Needles is a row of three distinctive stacks of chalk that rise about 30m out of the sea. The Needles Lighthouse stands at the outer, western end of the formation. The formation takes its name from a fourth needle-shaped pillar called Lot's Wife, that collapsed in a storm in 1764. A perfect starry night for astrophotography. It was pitch dark when we started our climb up St. Catherine's Down. It was so dark that we literally couldn't see our hands and we had to climb up the hill that had no trail and a sheer drop on one edge. 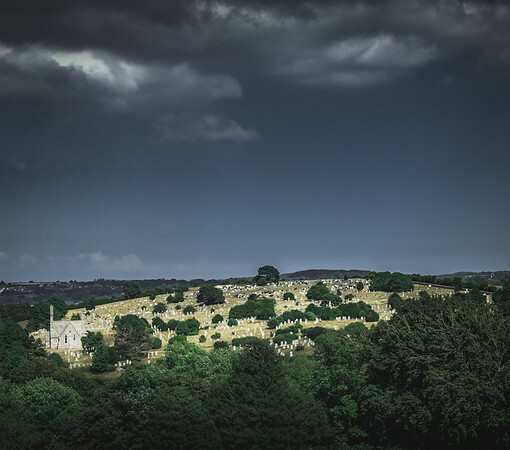 That combined with the fact that the Oratory is an abandoned medieval building located on a 3000 year old Bronze age burial ground made for a perfect spooky setting. The climb was certainly exciting and we got some good shots of the milky way. 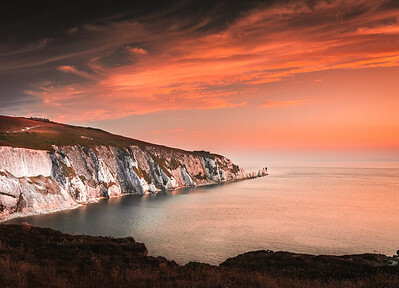 Sunset at the Needles. Taken from the viewing platform right next to the car park. I love this about Isle of Wight - all car parks are strategically placed and offer tremendous views. We were running a little late for sunset on the day and by the time we parked the sky was already looking like this, so I decided to get a couple of shots in before we descended to the beach as the sky turned from bright orange to pastel shades of pink and blue. 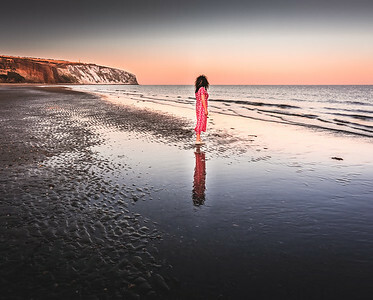 Sundowner at Sandown beach on the Isle of Wight. I really liked these moss covered rocks on the beach. They looked kind of out of place. You would expect such rocks in a forest but not in the middle of a sandy beach. Great for some foreground interest and adding a bit of contrasting green to the scene. 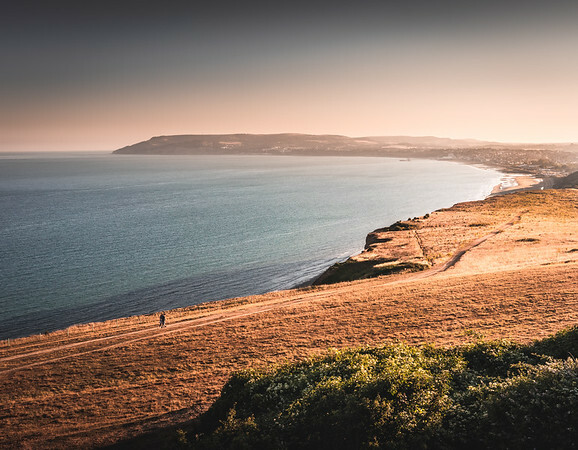 A couple strolling along the coast on Culver Down in Isle of Wight as the sun sets. You can see the beach town of Shanklin in the background. Just a random view from a random road side parking as we were driving down the road towards Shanklin. Carisbrooke (Mountjoy) Cemetery and Chapel as seen from the top of Carisbrooke castle. A few gaps in the rainy clouds created nice dramatic lighting conditions for this shot. Taking a walk around a random parking we came across while driving around Culver Down, I noticed these shrubs with with bright yellow flowers on an almost barren landscape. The plants had minimal leaves and these bunch of flowers on the top looking almost like a bouquet. The beach town in the background is Shanklin.